My parents, Anne and Alan Lloyd met in the early 50’s whilst attending Goldsmiths College of Art in London on a Teaching Arts and Craft training course. My parents moved the family back to Wales and set up a small studio pottery at our home in Carmarthen. I can remember making my first pots on the wheel at 6 or 7 years of age – all ashtrays! 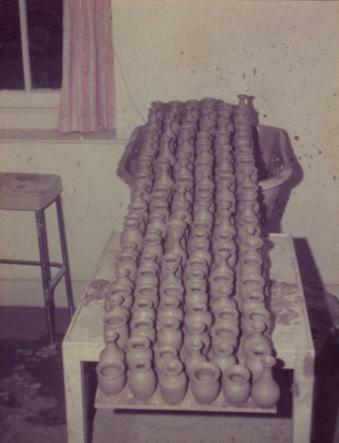 In January 1974, at seventeen years of age I was invited to join a production pottery as an apprentice. The pottery was in Pilling, Lancashire and was run by Jim and Vi Cross. Jim had been a student of my father’s at Trinity College, Carmarthen. The adventure begun as I took my 1956 split windowed Morris 1000 up the M6 motorway to Lancashire. My home, a small caravan sited in the back garden of the pottery, surviving off cheese sandwiches and beer. down the racks and see hundreds of glistening wet pots made entirely by hand. In the summer of 1975 my mother became seriously ill and the decision was made to return home to Wales and help establish a new family pottery business. A suitable end of terrace building was found with a shop and coach house situated in the old village part of Barry Island. 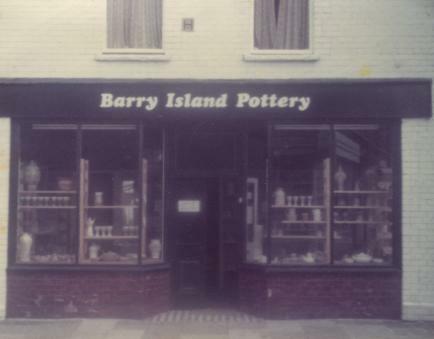 After many months of hard work my father and I opened the Barry Island Pottery Shop on the 1st December 1975 in anticipation for the Christmas trade. Fortunately everything went off to a flying start and the shop flourished. Hand made pottery was very popular and competition was huge and because of this we had to make and design a different style of pottery which would give a new business every chance of survival. In order to compete within this mass production world the introduction of hand pierced lamps and large coiled lamps. A new era selling under the trade name of Lloyd Ceramic Lamps began. Within a few years we were supplying craft shops and department stores all over the world. 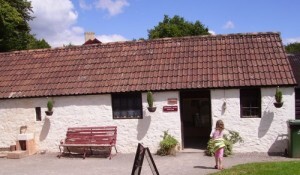 By 1989 a second pottery was established within a National Museum of Wales visitor centre at the Museum of Welsh Life in St.Fagans, Cardiff. I was appointed the resident potter and the main production was functional pottery made using traditional methods. Wassail bowls, puzzle jugs and slip trailed ware was produced as no local pottery continued to produce yellow slipware. St Fagans Pottery business grew quickly and became profitable selling directly to the visitors. We set up a throwing room for the visitors to have a go which soon became an important hands on experience for the visitor. My special thanks must go to Peggy for the many years of loyalty, freindship together with her unrivalled retail skills. The old Barry Island Pottery selling exclusively to the trade was closed in 1990 and I continued to produce my speciality hand pierced lamps at St.Fagans. The lamp range continued to be developed with many new designs evolving and my lamps are still very much in great demand and sold to customers all over the world. 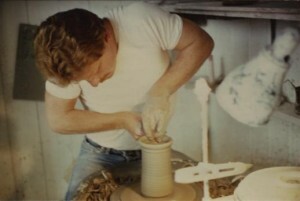 In September 2012 St. Fagan’s Pottery was forced to close after 24 successful years of trading. Despite the fact that we had massive support from the visitors to stay open the museum still decided to offer the building to the restaurant to sell jacket potatoes. The museum crafts sadly are slowly but surely disappearing. Fortunately Lloyd Ceramics is continuing to trade via my production studio at my home in Barry, Vale of Glamorgan (South Wales). July 2015 I am pleased to announce the opening of a new Studio / workshop in Pembrokeshire. Please see contact details via the contact page.